Bernese related articles and Links to other Bernese resources. for friendly, free, unbiased, expert help and advice. Regular updates of Bernese News, announcements and reports. Keep up to date with what is happening in the UK Bernese community! Bernese Mountain Dogs are without doubt a magnificent, stunningly beautiful breed of dog. Bernese are an increasingly popular choice for British dog lovers who wish to share their lives and their homes with a large, beautiful pedigree dog. 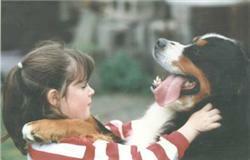 There is a thriving Bernese Mountain Dog 'community' in Great Britain which consists of enthusiastic owners and breeders who have knowledgeable, practical information to share with those who, very wisely, want to find out about the pleasures and pitfalls of Bernese Mountain Dogs before taking the step of acquiring one. DONT BECOME THE VICTIM OF CLEVER SALES PATTER AND ALLOW YOURSELF TO BE SOLD AN OVER-PRICED, POOR QUALITY PUP! Don't make the mistake of buying a recklessly bred, badly reared, poor quality Bernese bred by an unscrupulous breeder with a smart sales-pitch who sells pups via classified adverts or on the Internet when with a little careful research and seeking some good advice you can find carefully planned, well bred, lavishly reared, good quality Bernese bred by knowledgeable, experienced, reputable breeders in Great Britain. Be a wise buyer and arm yourself with GOOD information and if in doubt SEEK advice on locating established, knowledgeable, specialist, REPUTABLE Bernese Mountain Dog Breeders in Great Britain! Click on the UK BERNESE EVENTS CALENDAR button on the left-hand Menu and attend some Bernese shows and gatherings to view and compare Bernese; experience first-hand the huge variation of size, temperament and activity level that occurs within the Bernese breed and meet Bernese breeders and owners.